The kitchen has evolved into a shape shifting, functional art installation and this conceptual showroom sculpture by Silestone proves that fluidity of form can captivate the human imagination! The domestic application of this fantastic design may need a little tweaking though! I don't have any words to appreciate this post.....I am really impressed . Very interesting kitchen design. But wouldn't this take a lot of space and be impractical? This is absolutely awesome. I love it! We are remodeling our kitchen and looking at some kitchen design in Halifax. Hopefully we can suggest something like this for our remodel! Thanks for posting. Hey !!! Thanks for sharing very important information on this blog. Man, this was some rally swanky looking stuff. It really reminded me of a lot of kitchen design in Halifax that I saw last summer. They are doing some pretty amazing stuff I tell ya. This type of modular kitchen is amazing and the kitchen bench top is fully made up of quality wooden material. The marble top is superb. 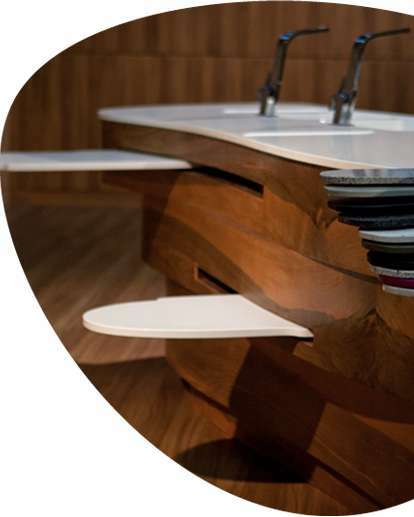 The kitchen sink is designed and embedded in the counter top itself. The cabinet drawers are slide-able. 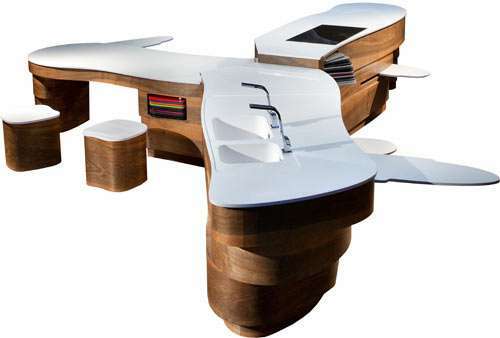 This modular kitchen looks like a perpendicular shape. Generally island kitchens are incorporated in larger space houses. Very interesting kitchen design . I love it!I have found a new alliance opportunity for Designers/Interior Designer and Architect with a company called GROHE. I would recommend if you are any of them.. to associate with GROHE Designer Alliance. Interesting kitchen design. You have that art of designing. Really impressed. Please keep posting. The marble top is very impressive and it provides a design longevity into the future. Ohh my GOD. These are mind blowing man. I love and work on colour kitchen. I enjoy this work very much too. thank u very much for the post on kitchen planning and installation Melbourne, it was very useful ..
Silestone always comes up with amazing designs. Being in the same niche, I envy them so much. But always appreciate your work. It's always great to see Silestone pieces. There is another piece of design to be mesmerized. I will try it with Granite Worktops although I'm not sure how it will look. Thanks for the treat of sharing this with us Silestone! I really like the design of this kitchen island. This is something that I would like to have installed in my home. I like how there are trays that slide out of it. I think that would be really handy for cooking multiple items. I am all time fond of reading the blog, when I reached to this blog I wondered to read such informative article, it inspired me a lot thanks. Thanks for sharing the grateful information. I regularly visit your website to get information. I really like the design of this kitchen island.